This is a tale of stubborn politics, war, courage, resilience, legal challenge, and hope. It tells of the evolution of a young democracy, and the consequences of decisions that have shaped that process. 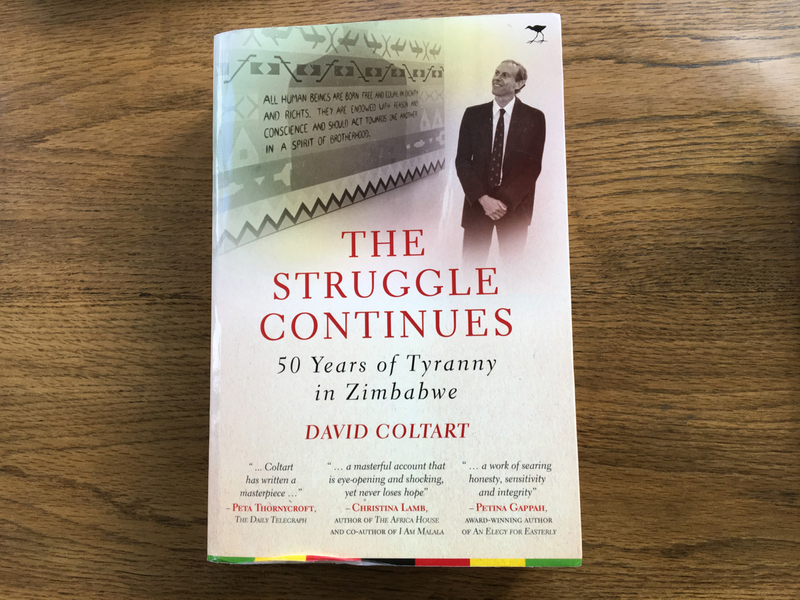 The author, David Coltart, born and raised in Zimbabwe, is an experienced lawyer and politician who still lives in the country. He writes with a style that is clear and controlled, one that allows the subject to reveal itself. In interviews the author describes his book as “an autobiographical political history of the last fifty years in Zimbabwe”, the fifty years being those between the unilateral declaration of independence by Ian Smith on 11 November 1965, and the fiftieth anniversary of that declaration – 11 November 2015. David Coltart’s view is that Zimbabwe has endured tyranny for that entire period. In the book he uses his own life to show the changes in the country during this time. David Coltart was born in 1957, in Bulawayo, Zimbabwe’s second city. His childhood, like that of many other whites in the country born at a similar time, was one of privilege and sport, of unquestioning, happy indulgence in all that Zimbabwe had to offer. As a young man he is drawn into the country’s civil war and serves his required time, from September 1975 to January 1978, as a member of Ian Smith’s security forces. This is his first taste of working closely with members of Zimbabwe’s majority black community and the experience, combined with what he sees of the war, sharpens the questions he is already beginning to ask about the country’s future. Military service is followed immediately by four years studying law at Cape Town University. They are years of profound change both for Zimbabwe and for David Coltart. Zimbabwe gains independence, and Robert Mugabe becomes its new prime minister. David Coltart renews his Christian faith; involves himself in politics; meets the woman he is to marry; and completes his law degree. The changes to both country and lawyer determine the course each will take over the next twenty-five years. It is a difficult quarter of a century. David Coltart returns to his home town of Bulawayo. At first he is a supporter of Robert Mugabe, and of the inclusive way forward that is promised, but gradually that support is eroded. It comes away in chunks as Robert Mugabe’s political party, ZANU PF, moves ruthlessly to bury its opposition, much of it based in the area around Bulawayo. It is a brutal time. Human rights lawyers, the Catholic Church, and others try to help but their dangerous work can achieve little against the forces behind the government backed atrocities, and the secrecy that surrounds them. The Struggle Continues traces this period, and the years that follow, with understated precision. Each pared down description drives us on through Zimbabwe’s history. There is no self-pity or rage, just evidence laid out before us in order that we might understand why the genocide of Gukurahundi still scars the country, and that we might see what has sustained those who continue to insist on democratic and legal standards. The second half of the book, post-millennium, increases in legal and political intensity. It is a time of farm invasions, legal battles over the country’s constitution, political fractures and repeated electoral fraud. Co-operation and hope sit courageously beside mismanagement and abuse as the country plummets towards economic collapse … yet there is no sense of walking away. David Coltart – husband; father; leading human rights lawyer; international speaker; founding member of the opposition party, the Movement for Democratic Change; devout Christian; and cricket enthusiast – is a man who does not stop. He has served his country under Ian Smith and Robert Mugabe. He has done time in the military, the law courts, and parliament, and he remains determined to help Zimbabwe … to see it “become the jewel of Africa – a beacon of hope for the entire continent”. The Struggle Continues is a tale with little bitterness or emotional indulgence. Instead it focuses on the facts as the author understands them, and on the lights in the darkness. It is an account that moves forward relentlessly, and that gives witness to some of the many who have tried, and who still try, to steer Zimbabwe towards a better future. It is an urgent plea from man who knows the hazards that lie ahead … he has met them before. A YouTube clip of an interview with David Coltart in 2016 in Scotland. This entry was posted in Books, Books on Zimbabwe, Non-fiction, Reviews, Zimbabwe and tagged Book Review, Bulawayo, David Coltart, Gukurahundi, human rights, politics in Zimbabwe, The Struggle Continues, Zimbabwe. Bookmark the permalink.